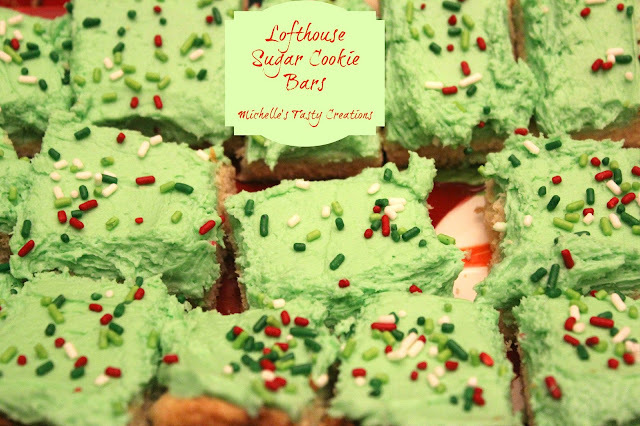 Last week I was browsing some of my favorite sites again for Christmas cookie idea and came upon this recipe for those famous Lofthouse Sugar Cookie Bars on Cookies & Cups blog. These are like those ones they have in the store that are so super soft they fall apart in your hand and lets face it, they don't really stay in your hand all that long. These were just as yummy, and the frosting will knock your socks off. 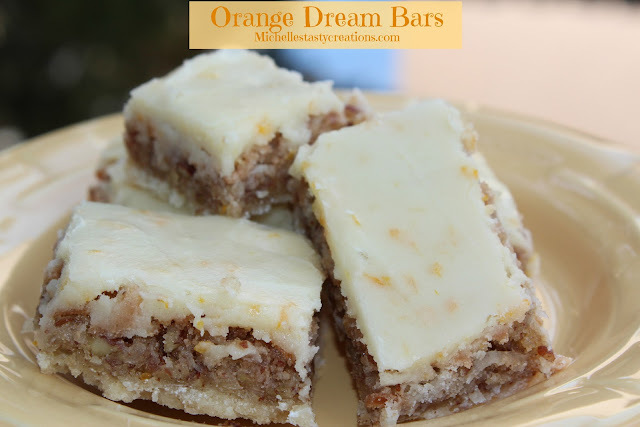 I love that they are a bar recipe but could still be made into a cookie if you wanted to. 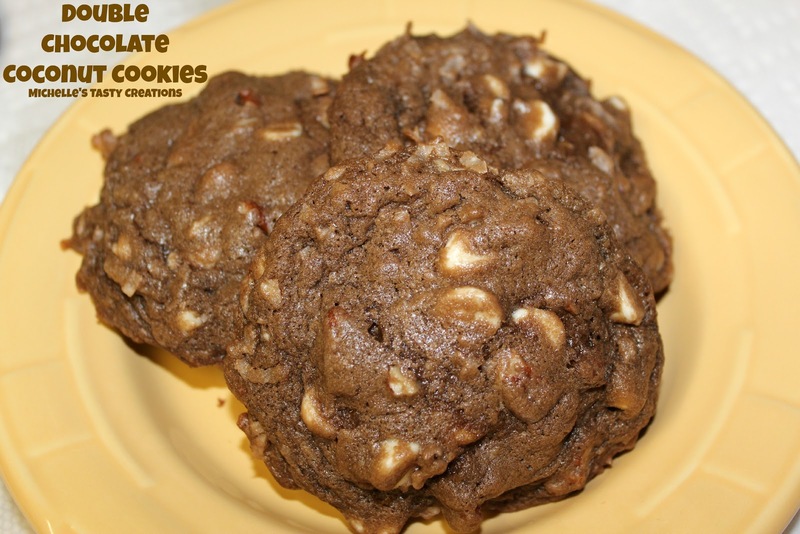 Thank you to Shelly at Cookies & Cups for posting this and sharing the recipe with everyone. I hope you'll give them a try and let me know how you like them. I know I'm a little late on listing all the cookies I made this year for Christmas and that is mainly because I'm not done making them. Every day for the last couple of weeks I would start the day off with "Today I'm going to try out some new Christmas Cookie recipes" and every day I was lucky if I got one or two recipes made. Then when it came to a couple of days before Christmas and time to recreate them, I didn't have the time. Hence, I am still making cookies! I started baking as a teenager and one of my first cookbooks; that I still have and use, is the Sunset "Cookies" step by step techniques cookbook which is amazingly still sold here and I would suggest every beginning baker have one. It is filled with traditional cookies as well as some new ones. 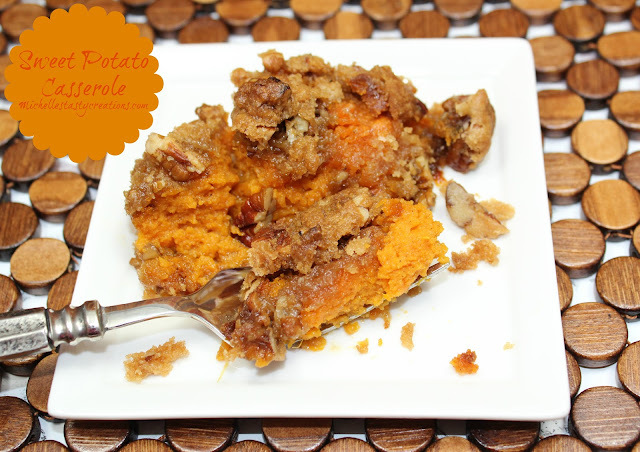 This recipe is another that I only just tried this year and absolutely love. And it has coconut in it along with a yummy orange frosting. In the bowl of a stand mixer or large bowl, cream butter and 1/2 cup of the sugar until creamy. Add in 1 cup of the flour and mix until it resembles crumbs. Press into the bottom of a 9 x 13 (I used a 9 x 12 throw away tin pan) and bake for 10 minutes. Remove from oven and let cool. In the (cleaned) bowl of a stand mixer or medium mixing bowl, place eggs and beat until light and lemon-colored; then gradually beat in the remaining 1 cup sugar. Beat in the vanilla; remaining 2 Tbl. flour, salt, and baking powder. Stir in the coconut and nuts until thoroughly combined. Pour coconut mixture over the top of the crust, spreading evenly. Return to oven and bake for 20 minutes or until topping is golden. Cool completely. To make the frosting, beat butter and powdered sugar until creamy. Add vanilla and orange peel, mix until smooth. Beat in enough orange juice to make a good spreading consistency. Frost bars. The original recipe calls for cutting the bars before frosting so that you don't crack the frosting while cutting the bars, but I didn't have that problem, because I just made sure the frosting was set before cutting, and lets face it, I'm not giving these to critics so it's really okay if they are a little cracked looking, they are still delish! And in case you were wondering, here's what my book looks like after years of use. And I can still read the recipes so that's all that counts! I thought I would let you know what I've been up to in the craft world. I hand made all my Christmas cards this year; haven't done that in a few years, and had a great time doing it. I found a couple of new products that I ABSOFREAKINGLUTLY love. The first being the new pens I picked up at Stampers Corner, my local stamp and scrapbook store. I was in the store looking for new ideas when I spotted a huge display of pens, so I asked the lady who works there about them and she said they were wonderful and that I would love them because they don't streak. Well, guess what? She was right! I LOVE my new Copic sketch markers. I also dusted off my Cuttlebug and used it for cutting circles in my cards using the second new product I found this year - Sizzix-framelits. 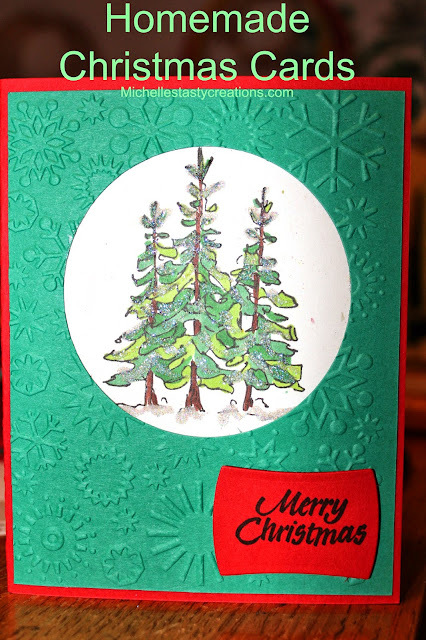 I also used the Cuttlebug for embossing my cards using the embossing folders I have for the machine. 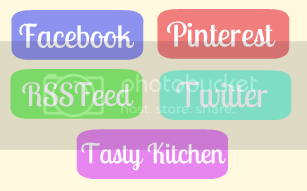 I use an assortment of wood mounted rubber and peel and stick acrylic stamps when making cards. I used acetate for the circles cut in the cards to hold back the glitter and fluff I used to simulate snow. I used a 3-D crystal liquid to apply glitter to the trees, snow, snowflakes, hats, etc. I used 3-D rhinestones for the nose and antlers on the deer, and I used ribbon on a card or two. Some of my favorite stamp companies are Stamps by Judith, which I have a ton of, Stampendous, which has my favorite monkey, Changito, and various artists I pick up at the stamp store. I hope you all give handmade card making a try. I didn't take pictures of the actual process just of the finished cards. If you have any questions please feel free to contact me. 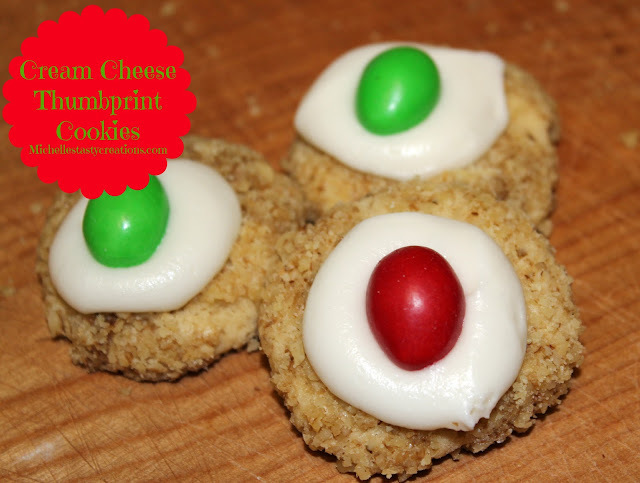 I have tried several new recipes this year for bars that I'm going to be adding to my Christmas cookie list that I make every year. I have found that bars are just as yummy and a lot less time consuming than cookies too. 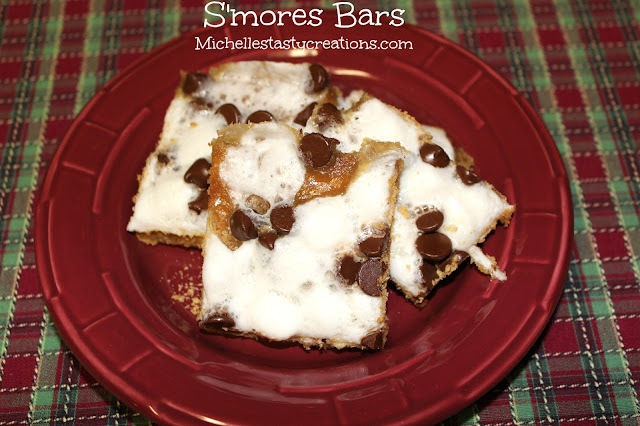 I found a really easy, super yummy recipe on the back of a graham cracker box for S'mores bars the other day. I have made them twice in the last three day because they are so good.I hope you'll give them a try and let me know how you like them. Line a 15-1/2 x 21-1/2 inch sheet pan with parchment. Line the sheet pan with the graham crackers in a single layer breaking some to fit the pan. Set aside. Preheat oven to 350 degrees. Melt butter and brown sugar in a medium saucepan over medium heat, stirring constantly, until smooth and mixture just comes to a boil, about 5 minutes. Pour evenly over crackers and using a spatula completely cover all graham crackers. Sprinkle marshmallows and chocolate chips over the graham crackers. Continue baking 2 to 3 minutes or until marshmallows begin to soften. I watched my friend Lupe's girls last week and this week for a day while she worked; and they are the cutest and craftiest kids. Rebecca is allergic to eggs so the poor thing can't ever eat cake, cookies, desserts, food, etc with ANY egg product in it. I am always looking for recipes without eggs for her and today while browsing a new cookbook I have and haven't used yet, we found that a lot of the "Bar cookie" recipes don't have eggs in them so we went crazy today. Now keep in mind that I had a 7 and 10 year old here all day keeping me on my toes, so in the midst of all the crafting and baking and out to lunching, I forgot to get some pictures of the bars and being as I let the girls take most of them home, you'll have to trust me on the whole Yumminess scale of the day! The first recipe I used from my new cookbook is Congo Bars. So here's what happened today. I had already been crafting with the girls all day and by the time we got to baking, we were SOOOO excited to find some recipes without eggs that I wasn't really paying attention to the exact measurements, and the fact that the darn font is SO stinking small in this cookbook, that I put a whole can of sweetened condensed milk in the recipe so I had to double the rest of the topping ingredients. So when you make these, and I know you will, don't be worried if yours aren't quiet as thick looking. The above recipe is the correct one. Spray a 9 x 9" baking pan with cooking spray (Pam) and set aside (I used a 9 x 12 disposable pan). Preheat oven to 350 degrees. Place the graham crackers into a resealable bag and zip closed. Using a rolling pin or meat tenderizer, make your own graham cracker crumbs. Measure the flour, baking powder, and salt into the bowl of a stand mixer or medium bowl. Stir together. Add the graham cracker crumbs and light brown sugar. Mix well. Add the butter and mix until it resembles wet sand. Pour into prepared pan and press into the bottom of the pan with your hands. Bake for 10 minutes. Remove from oven and set aside. Mix together the coconut, chocolate chips, and the sweetened condensed milk in a bowl until combined. Add the pecans and stir. Spread the mixture over the crust and bake for 20 minutes. IF you do like I did and have to double the topping recipe add about 10 minutes to the cooking time. 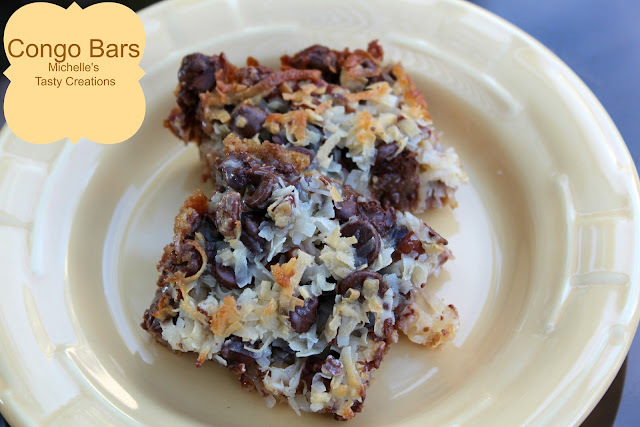 Now I know they look like those seven layer bars, but for coconut lovers like ME, you'll appreciate the simplicity of less ingredients in the filling. They are SOOO Yummy!